Belgian guitarist Dushan Petrossi is a very active musician, having two bands to write music for: IRON MASK and MAGIC KINGDOM. The first is set up as a Hard Rock band with neo-classical influences, while the other aims more to please the Power Metal audience, even though both bands, in general, please both audiences. Since MAGIC KINGDOM’s last album, “Symphony Of War” (2010, see my review here), Dushan has been more at work for IRON MASK, for one reason or another. The result: “Black As Death” in 2011, and “Fifth Son Of Winterdoom” in 2013. You can find my respective reviews here and here. Both bands have undergone some line-up changes in the past few years, so that could also explain why it was easier to focus on one band and let the other in the fridge until the circumstances were right to bring it back out. But Lady Fortuna found the time right to pay Dushan a visit and present him with new members for both of his bands. 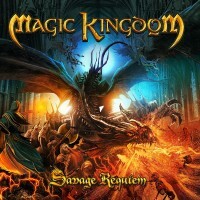 MAGIC KINGDOM is thus back with a new album, number four since the founding of the band in 1998: “Savage Requiem”, released in March 2015. It begins with “In Umbra Mea” (In My Shadow), a hymnic intro in which the guitar and harpsichord (keyboards) play together, offering a neo-classical trip back in time. The symphonic backing plays a counter-melody. The ending connects directly with the furious, melodic start of “Guardian Angels”. Carrying on, galloping Metal joins the fold. Dushan and co. took their time to build the song before letting new vocalist Christian Palin (ex-ADAGIO) set his vocal chords to work. The verses, in which Christian’s voice fits well, reminded me of the first few albums of the Swedish Power Metal band NOSTRADAMEUS. The situation gets more passionate, especially vocally, in the pre-chorus and of course the chorus, where the music unleashes its might. Solos are set halfway with keyboards in the back. There’s an occasional bass too. In the second part, musical fury is let loose. After the headbang-friendly moment, so to speak/write, the intro theme returns to start rebuilding towards the chorus. A very good start of MAGIC KINGDOM’s fourth album. “Rivals Forever” is another catchy and worthwhile song. It’s a whirlwind of guitars and pounding drums. Fast Power Metal joining forces with bombastic music, resulting in an energetic ball of sound. Melody creeps in or out in the pre-chorus, where the vocals follow the music, and into the full-on, melodic and furious Power Metal of the chorus. It made me think of the IRON MASK album “Black As Death” and even MAGIC KINGDOM’s previous album, “Symphony Of War”. Christian’s rough-edged voice fits well here. As you could expect, the solo is not your typical Blues solo. When the song is all about power and energy, then the solos follow suit, as does the drumming. And this song has enough room for instrumental and solo talk, even in the last instances. Luckily there’s “Ship Of Ghosts” to bring salvation. A melodic intro, followed by that same melody, but wit Power Metal guidance. Neo-classical guitar work is plentifully present, as are the thundering drums. The firm, straight-forward verses rock and link nicely with the bombast of the pre-chorus and the classic uptempo Power Metal of the chorus, where the vocals and lead guitar form a duet. This is a powerful track, on all levels. The solo section is at first the “Anthem of Europe”, then something totally different. Afterwards, as is the case in all the songs, the band goes back to the chorus and so towards the end. The title track, “Savage Requiem”, takes a bombastic start, contains a catchy melody. Keyboards serve to make the song more complete, albeit via a different melody, while the classic elements (vox, guitars, drums) do their own thing. At some point there’s a pounding, destructive break (as the drums clearly indicate), during which the harpsichord melody made me think of the NES-game “Mario Bros.” and particularly the scene when Mario is in a dungeon. That’s not meant as an insult, just a funny similarity. There’s a dark bridge, after which I expected a solo, but I was misled. The solo comes in later. And it’s wild, yes, and the drums go in overdrive, but luckily the main theme returns to stabilize everything. All in all, another good song. Time to make a trip into the East with “Four Demon Kings Of Shadowlands”. This song starts with an orchestral intro, score-like… We’re in India, I think, or in that (large) region. It doesn’t take long before furious, pounding symphonic Metal kicks in. The matching of the music and vocals, in the verses, sounded a little awkward to me; it’s as if they had to match, like you would match two very different pieces of a puzzle. Melody is key in the pre-chorus, as it is in the galloping, hymnic-sounding chorus. Christian doesn’t sound at his best here, but I can’t put my finger on why: vocal sound or age (i.e. difference with his time in ADAGIO)? As the solo moment draws closer, Dushan prepares to attack: fast Metal = fast solo. Again, in itself no problem, but one can easily overdo it and not have a smooth result. I do acknowledge Dushan’s guitar skills, for he is very skilled. “With Fire And Sword” needs not much explanation, right? Energetic and bombastic Power Metal, in vein of the material on “Symphony Of War”. And as it reminds of MAGIC KINGDOM’s previous album, I thought Olaf Hayer’s vocals would be a better match to the music, since Christian and high(er) notes don’t go that well together, from what I’ve heard so far. The solo problem is present here as well: a little too fast, or it could have used some polishing. “Dragon Princess” is the ballad on this new release, a power ballad with the emphasis on power. It begins with clean guitars, and backing keyboards, and no sign of Metal. But then the power is activated. The clean verses do differ from the pre- and regular chorus, so that’s ok. Last but not least: “Battlefield Magic”. Harpsichord, symphonic arrangements… it’s as if I’m listening to a RHAPSODY (OF FIRE) song. Until the battle is to be fought: a whirlwind of melody and powerful Metal. Quality assured! MAGIC KINGDOM is back, alright. Dushan probably couldn’t make a bigger statement than with this mighty and energetic “Requiem”. The production has more balls than ever and it shows in every song. More power means a vocalist to match that direction. Christian is a good choice, but the high(er) ranges are not his biotope, I reckon. The drums surely are a match, although I was missing some refined playing. Maybe that will come through on a or the next release. But these few details aside, Dushan and co. have delivered another qualitative record.